Developers are planning another tower near the newly completed 37-story Canvas condo, according to the Daily Business Review. 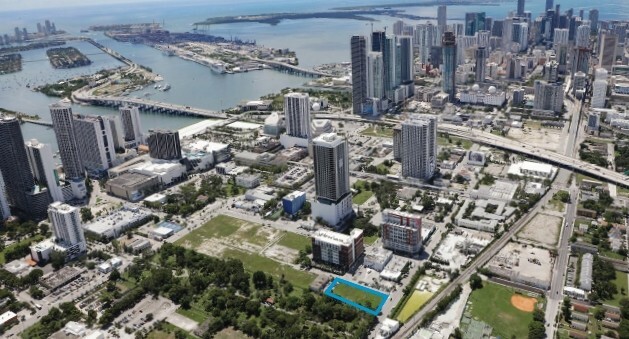 TSG Group and Linéaire Group closed on the purchase of a 30,000-square-foot property at at 1765 N. Miami Ave. on March 14, for $5.9 million. The land is in a tax-advantaged Opportunity Zone. The 37-story Canvas condo tower is nearby, as is Melo Group’s 35-story Miami Plaza, now under construction. The developers said they will build an apartment building between 18 and 24 stories tall, and include ground floor retail. There are at least three Opportunity Zone funds interested in investing in the project, one of the developers said. Construction is set to begin in early 2020, with completion in early 2022. This area is essentially a clean slate and the City of Miami and developers should be building complete streets. A lot of untapped potential for sure. So true..but this was also the case with the Worldcenter area and the city did not even achieve complete sidewalks, much less complete streets. What do you mean by “complete streets”? Good luck when it took over thirty years for them to make Brickell Avenue less like a generic highway. Didn’t Mana say it was impossible for anyone to build right now? LOL – That little muskrat is so cute when he pretends to be a developer. For some reason Reminds me of Avra. It only took her five years to restart The Royal Motel Restoration. Fantastic views of the city cemetery! Good thing that cemetery is old and covered in mature trees creating a canopy where you can barely see anything from above 2 floors. Won’t be first apartment project next to a cemetery. No, it’s not. There are a lot of people in this city who need to travel and see how cities much bigger than Miami build next to cemeteries. Why should I?.. if you think I don’t know what I’m talking about, then look it up, you have internet service.. stop being so lazy. when you live in such a bubble and and ignorant of your actual party demographics. As a filling station resident, we used to say we have the quietest neighbours.. LOL Also got to see a couple of burials.